How fast was Godzilla running? The first thing we can do from the footprint is to determine the Godzilla’s leg length. From fossils and stuff “we” know that most dinosaur hind feet were ¼ of the size of their leg length, so in theory we should be able to measure the footprint and multiply by 4. It turns out, though, that Godzilla has disproportionally large feet, so we’ll cheat and measure his leg length exactly. 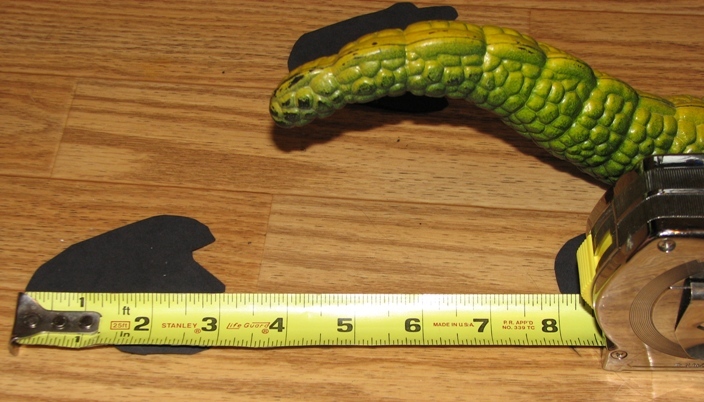 Our Godzilla’s leg length is 6.5″, which we’ll translate to 0.1651 meters so we can be all metricy like the scientists. Next we have to measure the stride length. Exactly 8 inches, which is 0.2032 meters. Relative Stride Length (RSL) = (Stride Length)/(Leg Length). 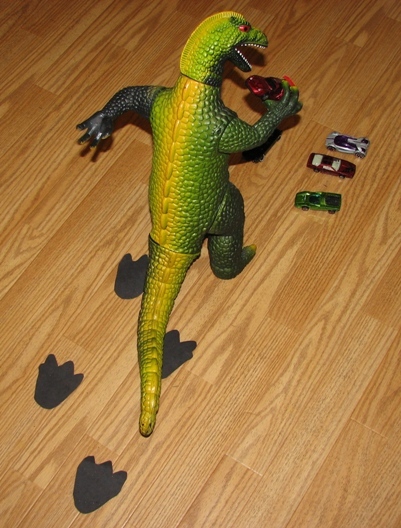 Godzilla’s Relative Stride Length is about 1.23. The constant “g” is that familiar gravitational constant 9.80665 meters per second per second. Bet you never expected to see that here, right? (with a correlation r=.9997, so it’s pretty good). If we treat Godzilla like a dinosaur, then plugging in his RSL of 1.2308, we get a Dimensionless Speed of 0.3228, which is close to the 0.3 we estimated above. So let’s use that. and we find that Godzilla’s speed is a whopping 0.41 meters per second! That’s 41 centimeters per second, which is pretty fast for a guy whose barely a foot tall. To put it into perspective, if you multiply by the scaling factor of 133.3 (from when we calculated Godzilla’s weight), it’s equivalent to the original 50 meter Godzilla running at just over 54 meters per second, or just over 122 miles per hour! Boy, you’d never know that he could run that fast, could you? Makes you wonder just how fast those Yemeni sauropods were booking, doesn’t it? I’m thinking that if I’d done the calculations before writing all this up, Godzilla’s footprints would have been placed a little closer together. Thanks to Bill Korth, who demonstrated this method of figuring out dinosaur speeds at a teacher workshop. He found it in Dinosaurs: The Textbook (3rd ed.) by Spencer G. Lucas. This entry was posted on June 11, 2008 at 8:32 pm and is filed under Godzilla, Uncategorized. You can follow any responses to this entry through the RSS 2.0 feed. You can leave a response, or trackback from your own site. So there’s hope for me after all! Of course! And, really, who doesn’t want to suddenly discover some dino footprints in their yard? Just imagine how famous you’ll be when you make your discovery!